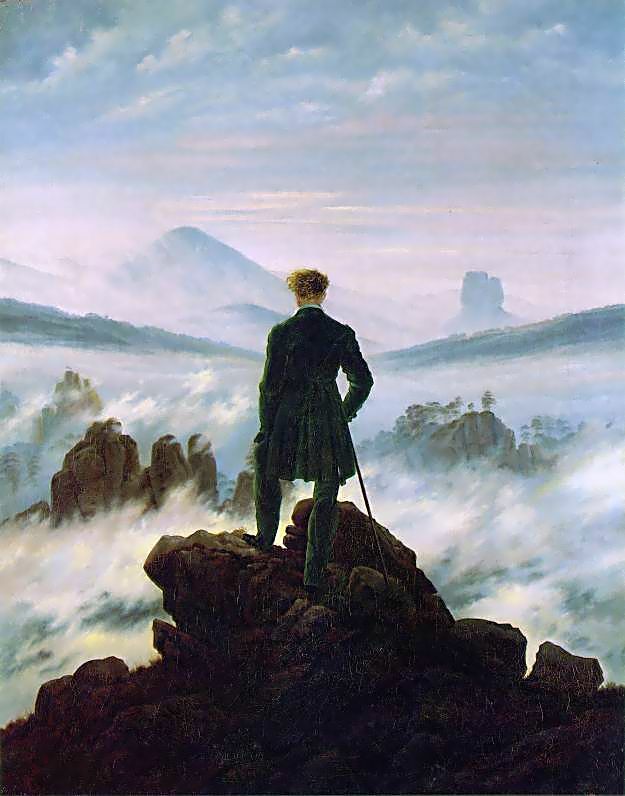 If we talk about Friedrich, we inevitably have to talk about romanticism. Contrary from other artists we can place in several art movements or in none, Friedrich’s work is completely romantic. So romantic that, if we search for the word “romanticism” in Wkipedia, the first thing we see is a picture of the painting we are going to talk today. This can make us thing on how valid is for the artist to express himself through his socio-historic moment. And it occurred to me the following questions: Is the work from Friedrich strictly a product of himself? How much freedom has the artist if he is too much submerged in an artistic movement? Unless you are Picasso (who, more or less, did every time anything he wanted), we don’t know and I won’t dare to answer but, anyway, the only thing I can say is that I think that the way the artists express themselves evolves with time and their context always influences them. Romanticism, as we have talked in a post from von Guérard, was an artistic movement which, especially in Germany, influenced practically in all branches of art at the end of the 17th century. And there was Friedrich, one of Alvaration’s favorites, firmly present. In today’s painting, we see the silhouette of a masculine figure on his back to us, on top of a mountain, looking downwards. Some versions say that he watches the sea, which is supposedly under the fog but I think that “sea of fog” in the title refers to a metaphoric figure rather than something literal. All Friedrich’s work is based on one of the characteristics of the romantic movement: the magnificence of nature along with the defenseless of the human being. Like this, nature is considered as the only thing authentic, opposite to the materialistic and artificial civilization. The man we see in the painting is located above the fog, assuming like an air of superiority and he seems marveled by the spectacle. The head, slightly bowed, gives us the impression of an individual saying a prayer, who executes it with a profound respect. Some relate this painting, particularly, with a experience Friedrich suffered as a child. Seems like our artist and his brother were ice skating in a frozen section of the Baltic sea. Suddenly, the ice brake a Friedrich fells in the frozen water. His brother, trying to save him, died. This experience caused Friedrich to suffer from depression and, one time, he tried to kill himself by slitting his neck. The painting Wanderer above the sea of fog (“sea” as in Baltic sea) might have symbolic relation with the painter’s experience as a child, and could be Friedrich himself who is, as an spectator who cannot intervene, looks at the turbulent and unpredictable of the natural world. The technique, we have to say it, is impeccable. The lighten background and the figure in shadows make us pay attention to the wild, the indomitable. Friedrich seems to tell us that, to get there, to the authentic, we must go through men and its rationality. Oh yeah, Friedrich was a hopeless romantic. ~ by Álvaro Mazzino on July 28, 2010. I think we could greatly benefit from each other. If you’re interested feel free to shoot me an e-mail. I look forward to hearing from you! Great blog by the way! Also, many chemicals are corrosive, especially to circuit boards. only be able to address the immediate problem but will also be able to better gauge how other areas of your home will stand up to water damage throughout the storm season. this web site is really good and the viewers are really sharing fastidious thoughts. Remember Book 13 of Wordsworth’s “Prelude” (1805, 1850). He climbs Mt. Snowden in Wales to see the sunrise from the summit. At the start, it’s hot, muggy and foggy. The climb is hard. He outpaces his companions. The fog finally gets brighter, and then–BOOM!–he’s alone on the summit, with the heavens above and the clouds at his feet. It’s a metaphor for the story of his life, which the poem has been telling–the story of a cultural breakthrough: from the Enlightenment, via a “nervous breakdown” (as the French Revolution turns into the Terror), and finally into Romanticism. Friedrich’s painting is culturally convergent with it. Wordsworth’s poem had not been published in 1818. Friedrich probably wouldn’t have known it anyway. Yet here’s this guy alone on a mountaintop, with the clouds at his feet, having an aesthetic, religious response–rather than an “Enlightened,” scientific one–to Nature. It’s totally Wordsworth. This entry was posted on July 28, 2010 at 11:25 and is filed under Romanticism.You can follow any responses to this entry through the RSS 2.0 feed.You can leave a response, or trackback from your own site.